Hanson Offers A Bold New 'Anthem' Isaac, Taylor and Zac Hanson have reworked their teen-pop sound to a matured intensity. The brothers discuss their Oklahoma roots, recording tensions, and meeting their wives at Hanson concerts. Brothers Isaac, Taylor and Zac Hanson have been playing together since 1992. Isaac, Taylor and Zac Hanson achieved ubiquity in 1997 with "MMMBop," the mega-hit with the wordless, sing-along hook. But the brothers — aged 16, 14 and 11 at the time — had already been playing together for years. And they're still going. Hanson's ninth studio album, Anthem, is out this week. Soon, the brothers will be marketing a beer, MMMHops (in honor of the band's 21st birthday). They've also started an effort to donate proceeds from their merchandise to aid relief in their home state of Oklahoma. "Whenever something really strikes a community, I think your confidence is a little bit shaken," Taylor Hanson says. "We performed in those schools. Those communities were really supportive of our band. We are going to continually be a part of that effort, because that is our home." The brothers Hanson spoke with NPR's Rachel Martin about how their attitudes toward life and music have changed since they first formed in 1992. On breaking out with "MMMBop"
Taylor Hanson: "I think we're proud of it. The interesting thing is that we were lucky to have success young. But we used to tell people, 'Just think of us as old guys with high voices.' When we started, we always saw ourselves at the beginning of a long career of music. That song represents our story. It's a garage band that loved soul music, doo-wop and classic American rock and roll. We wrote it, too. Zac is one of the writers, which makes him the youngest Grammy-nominated songwriter ever at 11." 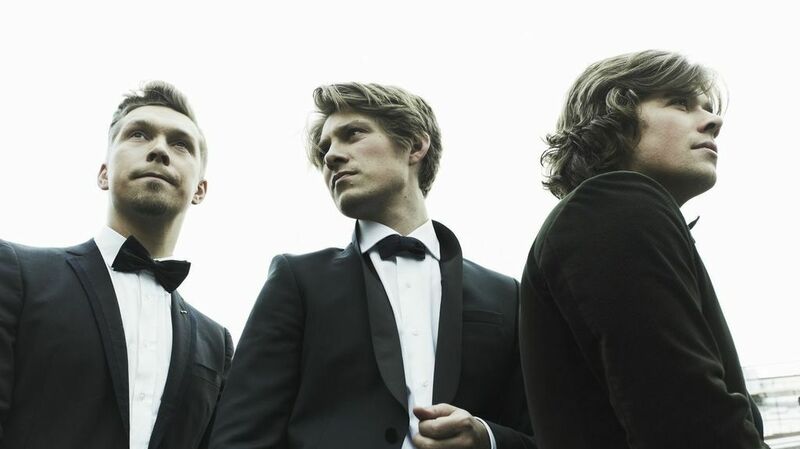 Isaac Hanson: "There is no question that we have evolved as a band. We're inevitably tight — if nothing else, it's our 16 years of practicing together. But all of it is still coming from the same place, whether I'm 16 or 32. I just want to write a great lyric and a great song — everything else is icing on the cake." Taylor Hanson: "I think this is an album where we had to really look and ask ourselves what was next. We had to step back and ask, 'Why are we doing this? What are we doing this for? Is everybody in?' There was a sense of intensity, size and scale to almost everything. We came away with wanting to be bold. The record needed to be anthem-like to hold all those punches." Taylor Hanson: "People meet at work, and we were at work. It's great." Isaac Hanson: "The short version [of my story] is, I see my wife standing about five people back. It was a standing-room venue, not a seated venue. She and her friend were really tall — my wife is about 5'9. She was easy to see above everybody. I thought she was really cute. So I sang a couple songs while looking directly at her to get her attention, threw a guitar pick and hit her. I wanted to make sure she knew I was talking to her. She still has the guitar pick."